I’ve really been trying to get this posted, but I’ve also been really busy this week. Finally, though, I am getting this up. Oh, and happy Fourth of July! Last night I made white chocolate snickerdoodles. They turned out extremely tasty! When I was mixing up the cinnamon-sugar to coat the cookies in, I do have to admit that the cinnamon smell seemed very out of place on July first. For me, that smell of cinnamon belongs more on October first. Cinnamon evokes thoughts of apple pies and holidays. However, I pushed past the feeling that I was being transported to fall and made these cookies. I have to say, July first, October first, April first—anytime is a good time to make these! My dad even said that they were really good, and he normally doesn’t like snickerdoodles. 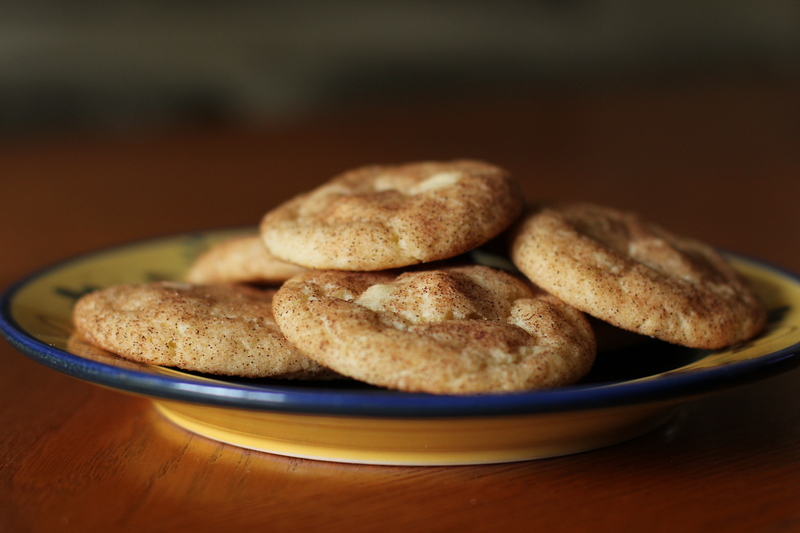 The snickerdoodles were soft and moist on the inside and packed with vanilla flavor. The sweet cinnamon coating perfectly rounded out the flavors of the cookies. I tried rolling some in just granulated sugar. While they were still very good, they just didn’t have the same warm, happy quality, if that makes any sense. I was a little worried that the white chocolate would clash with the cinnamon, but the flavors blended seamlessly. I really couldn’t pick out the white chocolate in the cookies. It just kind of became a part of the cookie. Now, my grocery store doesn’t sell white chocolate chips. They only sell “white” chips that don’t have cocoa butter in them. Instead of using these imposters, I bought white chocolate baking bars and roughly chopped them. Just to note: the recipe calls for two cups of white chocolate chips. Two cups of chopped white chocolate is about eleven or twelve ounces of white chocolate. So, go check these out. These are fun cookies to share with family and neighbors. I gave away three plates of these today and received plenty of smiles in return. If I could, I’d give you a plate, too. Posted on July 5, 2013 by rjoy19	• This entry was posted in Chocolate, Cookies and tagged Cinnamon, Cookies, White Chocolate. Bookmark the permalink. So glad you liked the cookies and I think white chocolate just about goes with everything!! You’re right. White chocolate really is so versatile.